In the 12 years since Band Aid, the charts have hosted a lot of charity singles – more than enough to give you a cynical familiarity with the shape of them. A terrible thing happens; the public is horrified; a number of pop stars make themselves available to help – some selflessly, some perhaps not; a sombre track is found and a dirge of a cover recorded; Number One is reached; the proceeds are (we trust) distributed; the matter is closed, and if any good is done we do not hear about it. The Dunblane single is almost completely different from any of this. The background: in March 1996 a terrible failure of a man walked armed into a Scottish primary school and murdered sixteen children and one adult. In the aftermath of this atrocity, public disgust and general political will made some kind of handgun ban inevitable. The question was – how far would it extend? A commission made recommendations which the waning Conservative government accepted: most handguns would be banned. A petition, circulating since the massacre, argued for stricter legislation: outlaw all handguns. As of December 1996, however, this was not on the table. If the Dunblane massacre had been the kind of tragedy to inspire a standard charity single, we can imagine what it would have been like. It would have charted in May or June, with the horror fresh in public minds. It would have involved a number of Scottish stars – Marti Pellow if available, certainly a Proclaimer or the fellow from Del Amitri. It’s entirely likely “Knockin’ On Heavens Door” would have been the song. It sounds – and would have been – obscene. The charity single we did get is not, because Dunblane was not that kind of event. The reporting of these crimes – honed by the British press with the Hungerford massacre in 1989 – takes place first at a horribly intimate level, tracing the murderer’s movements second by second, step by step, death by death, using maps and photos to tempt the reader into imagining what the mind wants to flinch away from. After a few days of this the media zooms out, and focuses instead on the aftermath. How does a family cope with the murder of a child? Nobody wants to see or show the real answer to that (“it doesn’t”) so instead the story becomes how ‘the town’ or ‘the community’ deals with it. Mostly the community wants the media to get the hell out, and the story begins to slip away. There is nowhere into this schema for music to fit, no celebrity response that wouldn’t seem like the most grotesque exploitation. But “Knockin’ On Heaven’s Door” invents a place for music, by taking the media’s prurient interest in ‘the town’ and making it tangible. The record is credited not to some one-off team, but to ‘Dunblane’ – the single is by and from the community, not just for it. This was genuine, to some degree – Ted Christopher, the musician behind the single, put together a band of Dunblane musicians to play (Mark Knopfler helps, but to lend professionalism as much as star power). The children’s choir on “Throw Those Guns Away” even includes classmates of the murdered kids. However sentimental the end result, this is an attempt at catharsis, not the kind of pat closure I’ve criticised on other event-led charity hits. 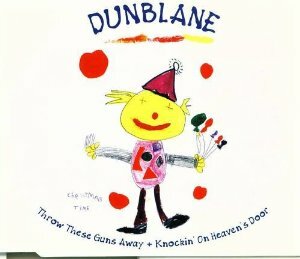 “Throw Those Guns Away” also points to the other thing that makes the Dunblane single unusual. It is an explicitly political charity record – perhaps the most focused political Number One ever. Most charity hits obscure the controversy and political wrangling that comes in tragedy’s wake: not so Dunblane. It is a specific intervention in an ongoing policy debate, a petition as much as a record: all handguns should be banned. Tony Blair adopted that policy, and it was law within six months of New Labour coming to power. Now, it’s not likely Blair adopted the policy because of this record, and the single isn’t taking a difficult or unpopular stand. In fact it was the kind of emotional open goal his opponents were regularly terrible at spotting. But the massive response to this single – nine months after the massacre – would at least have confirmed his instincts, and helped cement the policy as part of the UK political consensus. Nowadays, only Nigel Farage makes serious noises about loosening the handgun ban. In the end almost none of the standard objections you might have to a charity single apply here. It’s no celebrity junket, it’s a genuine response by (some of) the people affected, it’s pointedly specific in its demands, and it’s about its events in a way nothing since Band Aid has been. Its very success in those areas makes it virtually unlistenable – alone in the charity hit ledger I can’t hear it without thinking of what prompted it. Really though, the only thing it has in common with other charity hits is that the music isn’t any good. For once that doesn’t matter: this is as close to an unmarkable record as I’ll see. It gets an arbitrary number: these songs did the job they set out to, and now I will never play them again. #56-57 Makes a lot of sense actually. In the US, we had American Top 40 which used the actual Hot 100 until Soundscan kicked in in 1991, but it was only a radio show, had a lot of competition, and was played at different times in different cities (Sunday morning in my locale – which caused some conflict with my parents when I wanted to skip church to listen to it). There was also American Top 10 which was a TV show that broadcast video clips of the top 10 records every week, but again, appeared at odd off-hours and had a lot of other shows to compete with. 55: Top of the Pops is the answer, but I also think the almost completely objective nature of the chart give it an enhanced status compared to e.g. the US. When one sale = one chart unit, it means something, y’know? Otherwise only the broadest trends show up – disco at no.1 for two-thirds of 1979, and never again – and the charts tell you nothing new about that. Aiui the US charts, by including airplay, meant that labels could use them as a reliable marketing tool – to the extent that The Spice Girls could have an optimised itinerary scheduled, weeks in advance, to coincide with Wannabe reaching no.1. In a sales-only chart that event might or might not happen, so in short it’s more interesting. When the mid-nineties hit and the charts could be decisively gamed, they meant nothing, and Top of the Pops died with them so the causation wasn’t all one-way. It’s interesting for me to read comments about the ’90s being when the rot set in for the charts. I started watching Top of the Pops in 1999 and listening to the chart show in 2000. As far as how they worked, I didn’t know any different, but they meant a lot to me for the few years afterwards, both in hoping for my favourites to do well and just being interested in the patterns of everything else. I think that The Chart Show should get a minor mention here – you’d watch it to see if “your” chart was one of the featured ones, and see the trends in it spill over to the main chart. #28: It is not a “true story” and who are “we all”? #33: If you equate “ungradeable” with totalitarianism then I’m very glad that you’ll never be in a position to make laws for the rest of us to live by. “As such, it shouldn’t be graded on entertainment, which, in my view, is largely what the mark scheme for Popular is about.” That depends how you define entertainment. Wiki defines it as “a form of activity that holds the attention and interest of an audience” but Thomas Hamilton might have thought, in his own hopelessly warped and malevolent manner, that was what he was doing. Correct, it does depend on how I define entertainment. I subscribe to the second part of the wiki definition that you’ve left off. It goes on to say “or gives pleasure or delight”. Which is to say, in my reading, that you can do away with the attention and interest part and read it as “an activity that gives pleasure or delight”. I take no pleasure or delight from this record – but as I have said, I don’t think it is best viewed as a record or, by my definition, entertainment. TH might also have taken “pleasure or delight” in his actions, it is true. But, as I am my own judge of what I consider entertaining, I’m also comfortable in saying his actions are pretty far from entertainment. In point of fact, they’re pretty much the exact opposite. In point of subjectivity, they are. But with “taking pleasure and delight in his actions,” isn’t this why a lot of people remain uncomfortable with Top Of The Pops (squaring the comments circle there) and their gradual realisation that what “entertainment” meant to an audience and what it meant to some of the people within that culture might be pretty horrendous polar opposites? It probably is. I don’t find the prospect of young women being abused or young children being killed entertaining. Is it possible to divorce the first issue from seeing songs being performed in the TOTP environment? For some, I would guess so. For others, I would guess not. It’s sort of up to the viewer to decide for themselves, isn’t it? On the TOTP point, I am not an expert by any stretch as a) I don’t watch the BBC4 re-runs of the era in question (is seeing old performances from TOTP and cutting out DLT and the like not what Youtube is for?) and b) when I was watching TOTP on a regular basis in my youth, the presenters were people like Simon Mayo, Mark Goodier, Jakki Brambles, et al – before they started getting in the likes of Chris Eubank and so on – none of whom, as far as I am aware, are accused of anything like what DLT and Saville are accused of/did. So, whilst I abhor what was going on there, it’s not like it’s a stain on my own experiences of the programme (yet, I might add – who knows what else might end up coming out in the long term). In the eighties we are due the regular – ahem – “American chart slot” and also a regular(ish) American presenter who is currently also under a legal cloud. I’ve been trying to think a bit more about this record and its pretty laser like focus on what I think it is trying to achieve – i.e. a ban on guns in the UK – by contrast with some of the other songs I am aware of about shootings. There’s CSNY – Ohio (the Kent State shootings). Then you’ve got American Skin (41 Shots) by Bruce Springsteen (a studio version just having been released at the time of writing but probably inferior to the live version that has been kicking around since the start of the century). This is, at least in part about the shooting of Amadou Diallo by NYC police. There’s The Nobodies by Marilyn Manson, which seems to be aimed at the perpetrators of Columbine and the attendant media circus. Whilst these all have some element of fury about them, they also hide behind metaphors in some cases, strive for balance in others (41 Shots in particular caught a lot of flak from the NYC police but, to me, seems to both sympathise with the shooters – assuming that they made an honest mistake and wind up praying for him to live – as well as making a wider set of points about the way that certain groups have to prepare their children for the possibility that they can be killed by the police for doing not much wrong) or turn their fire on the media/government/society. There are embellishments and attempts to soften or obscure the point. None of them, and it might be because they’re all from North America “say something should be done about this, this is that something, do it” because the obvious “something” is limiting society’s access to firearms and, down that road, lies serious ruction that the artists don’t seem to want to confront. This is what makes the Dunblane #1 so remarkable, I think. There’s no room for argument, no ill-discipline, very few frills. It’s uncompromising and the better for it to meet its aims I think – and to tie with TheFatGit’s earlier comment, is difficult listening. Doubtless there are plenty of songs that do this in folk – a genre with which I have little experience – and I am sure someone like Pete Seeger would have maintained the focus on what should be done had it been up to him, but I am having trouble coming up with many songs in the rock idiom that are quite so precise. I think this is what makes it so uncomfortable – it’s not a usual thing to see at the top of the charts. Quick note re #70: the reruns don’t cut the links of DLT et al, they cut the entire programmes, so all the programmes they do show are whole (except insofar as they edit things for time, although they reinstate those for the 1am repeat)*. *not strictly true I suppose – due to licensing issues we got Legs & Co. instead of the film clip for the Grease songs, and it’s entirely possible they cut individual performances by suspect artists (although they left King in, so who knows) and I’ve just failed to remember. The reason they cut the entire programmes – and somebody wrote to BBC4 asking why they couldn’t just edit/pixel out the offending presenters and show only the music – is that members of the audiences for these specific episodes may be involved in ongoing legal action, and consequently the BBC are prohibited by law from showing them in any form until this is all resolved. I think there are also different rules/policies at the BBC about showing certain people as performers but not presenters, which is why JK popped up during the ’78 reruns but we’re unlikely to see his US chart slot. My understanding of the Grease situation is that BBC4 can’t afford to pay Polygram or whoever owns the copyright to the footage now for the rights to show them. If it’s the same situation with Watership Down they’re going to run into an imminent spot of bother. Ta for the additional detail, Punctum. Hopefully some way of staving off Bunnygeddon will be found and they won’t have to draft in Jemaine Clement in a wig. #72: I realise it wasn’t a chart-topper (well, not in the UK), but – I wonder if the closest point of comparison to this record might be “Give Ireland Back To The Irish” by Wings? #72 I’m not sure it’s that the artists don’t want confrontation (though it might be true in some cases) – it’s that in a strongly pro-gun culture making that kind of specific blanket statement would be as practical as “feed the world” or “give peace a chance”, so they feel the point is better made artistically through metaphor etc. You could record a song backing a specific piece of gun control legislation, but “Tougher background checks now!” (for instance) is unpromising pop material. Whereas in this case the record is pushing on an almost-open door – SOME kind of gun control law was inevitable after Dunblane – so throwing weight behind a particular outcome made sense. If a specific goal looks achievable and is suitable for a protest song you’ll find people making it. Vietnam era rock had a fair bit of stuff like “Bring the boys back home”. 76: I’m not so sure, now that I have had further thinking time about this, that I am right to say that gun control is the obvious thing that each of the artists could have been writing about. They could have pushed against an open door (Neil Young’s would be – stop shooting protesters, Bruce Springsteen’s would be – stop indiscriminately shooting black people, Marilyn Manson’s is something different but would be along the lines of – stop glorying in tragedy, media outlets) but chose not to. I wonder why? An open question for them – which will be presumably be answered with something along the lines of “well, this is what I wanted to write about, in the way I wanted to right about it” – the freedom to do so being difficult to deny, I’d have no problem with this. But still, if you’re going to go down this route, you could be more bold should you want. What I am pretty sure about is, as I said, that what marks Dunblane out is the intensity of its focus – you’re right too that it makes sense, given that some sort of gun control was inevitable following the events in Scotland. What Vietnam era rock stuff are you referring to? All the stuff I can immediately think of, principally by CCR, is just as bound up in metaphor (e.g. “Who’ll Stop The Rain?”) and oblique protest (like “Fortunate Son”) as the stuff I marked out at #72 rather than explicitly saying “bring them home” – which seemed to be Pete Seeger and the rest of the folk movement’s role. I suppose there is Country Joe’s stuff but who else are we talking about here? & If only “stop indiscriminately shooting black people” was an open door. “Prosecute [cop who did it]” is probably closer to the specificity you’d need for comparison, I guess. A more recent(-ish) example would be The Beat’s Stand Margaret. Although even with the ‘please’ in the lyrics, I suspect this one was pushing on a very closed door. And the door probably wasn’t even aware of any pushing. The handle’s not for turning. “No Clause 28” is an example of the classic slebs-together charity record model being used for a specific political goal (short-term failure, long-term success I guess). I’ve heard both sides. I personally think this rendition of KOHD is a true masterpiece (a very rare perfect 10); the hard-to-find flip side gets 8.4/10 from me. Both are truly inspirational and deserve to be listened to again, since these problems persist in the modern world. For the reasons stated in #28, 1. A loathsome artefact – probably the only thing I agree with my 11-year-old self about.